WATCH What is a Nor'easter storm? As a major winter storm hits the country, dumping snow and bringing a brutal deep freeze to the Midwest and East Coast, here are the answers to some of your most common questions about winter storms from ABC News meteorologists Max Golembo and Sam Wnek. This article was first published in 2018. What are the different types of winter storms? In the winter you'll often see nor’easters, also called coastal storms. These storms may occur at any time of year but are most frequent and most violent between September and April. 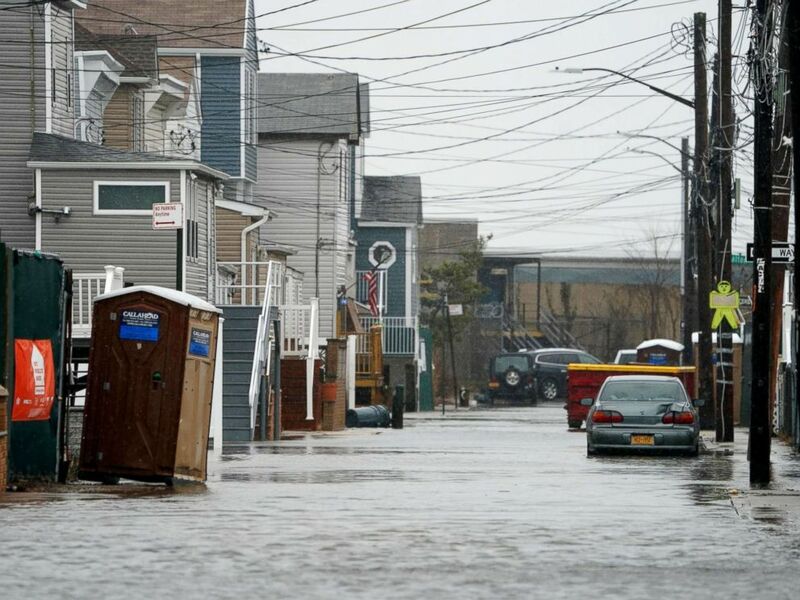 Nor’easters nearly always bring heavy rain or snow, as well as powerful winds, rough seas and sometimes coastal flooding. Nor’easters usually develop between Georgia and New Jersey, within 100 miles east or west of the East Coast. The heavily populated region between Washington, D.C., Philadelphia, New York City and Boston is especially affected by these types of storms. They usually move northeastward and reach maximum intensity near New England. A pedestrian walks near the coastline, March 2, 2018, in Newburyport, Mass. In the Midwest and other non-coastal parts of U.S., large storms are called mid-latitude systems. There are also weaker, clipper systems. A clipper system, usually called an Alberta clipper, is a fast-moving, low-pressure system that will move southeast from the Canadian Province of Alberta through the Plains, Midwest and Great Lakes. This low-pressure system usually brings light snow, strong winds and cold temperatures. A car sits in high water on a flooded street during rain and high winds, March 2, 2018, in the Broad Channel section of Queens in New York. How does a storm start? 1. Cold air. Below-freezing temperatures in the clouds and near the ground are necessary to make snow and/or ice. 2. A lifting force to raise the moist air to form the clouds and cause precipitation. 3. Moisture to form clouds and precipitation. Air blowing across a body of water, such as a large lake or the ocean, is an excellent source of moisture. How are winter storms named? Winter storms do not have official names in the U.S. But we do name hurricanes -- so the summer tropical season is when you can look for named storms. 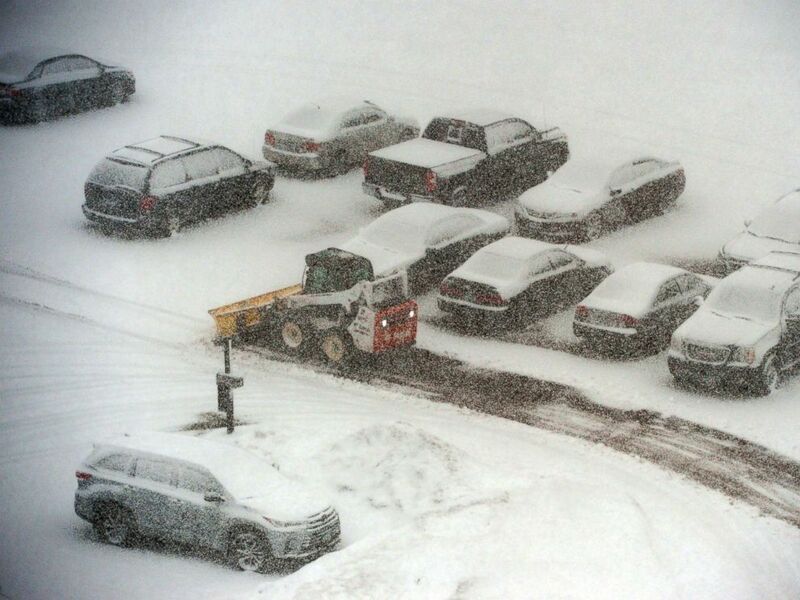 What should you do before a winter storm? 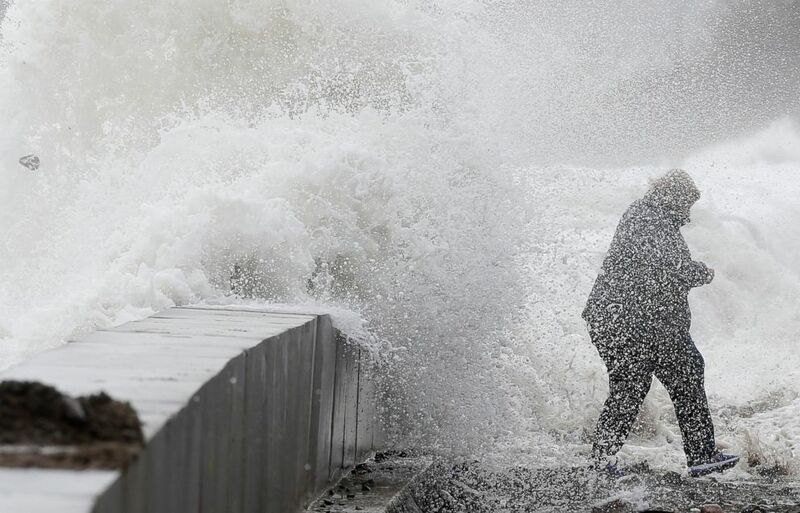 A woman gets caught by a wave as heavy seas continue to come ashore in Wintrhrop, Mass., March 3, 2018. Some major threats to your home are the loss of heat, power and phone service, as well as a shortage of supplies if the weather lasts longer than expected, according to the National Weather Service. The NWS recommends storing items including a flashlight and extra batteries, water and extra food that won't need cooking or refrigeration. Don't forget extra prescription medicine, too. With proper ventilation, you can rely on emergency heat sources including a fireplace, wood stove and space heater. The NWS says to make sure you have a working carbon dioxide detector and that the outside vent is clear. After the storm, make sure there isn't snow left in the outside vent. A snowplow makes its way past snow-covered cars in a parking lot in St. Paul, Minn., March 5, 2018. 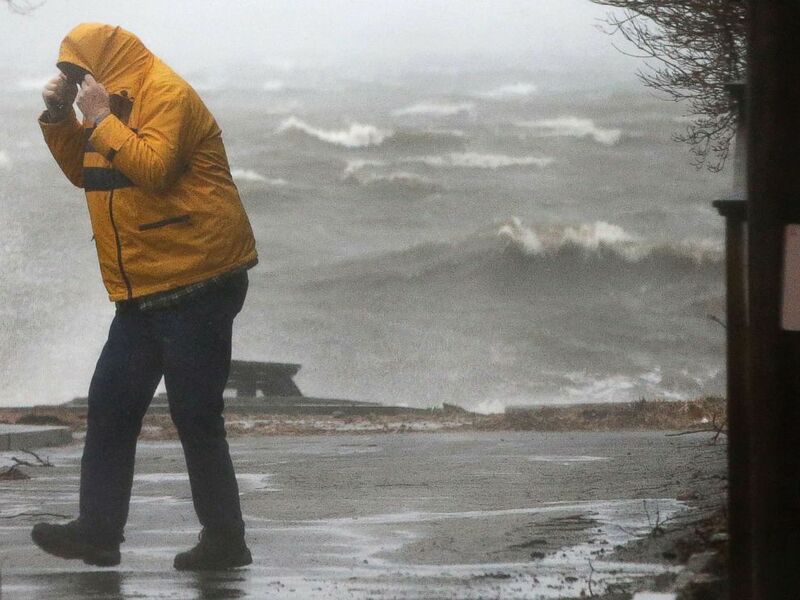 Those with prolonged exposure or those not dressed appropriately for extremely cold weather are in danger of frostbite and hypothermia, NWS meteorologist Jay Engle said. Dr. Randall Wexler, a professor of family medicine at Ohio State University, advised keeping frostbite-prone areas covered to avoid tissue damage. Warning signs for adults are shivering, exhaustion, confusion, fumbling hands, memory loss, slurred speech and drowsiness. For infants, the signs are bright red or cold skin and very low energy, the CDC said. Engle recommends to “dress in three or more layers. One big thick winter coat tends not to do the trick." "People really should keep their heads covered because that’s where the majority of heat gets lost," Engle added. Wexler also said the young and the elderly should be especially careful because their ability to maintain core body temperature is harder. 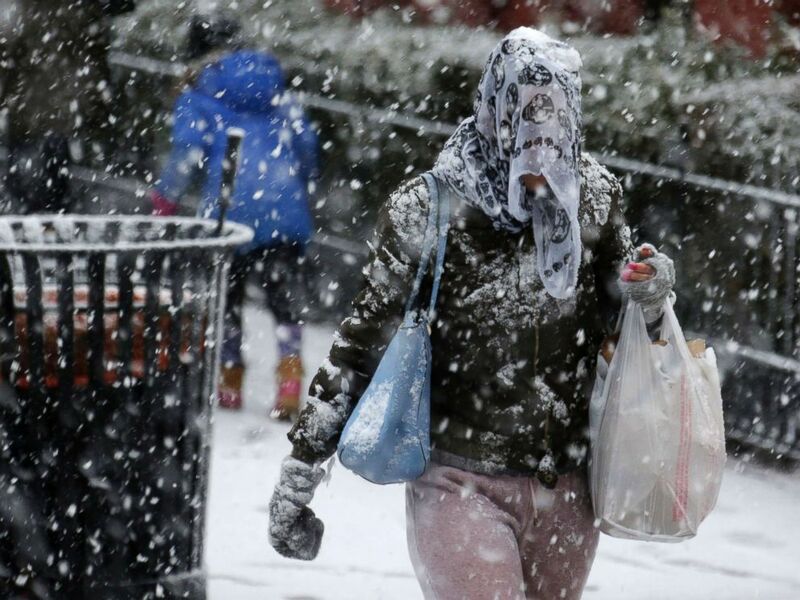 A woman puts a scarf over her head to try and keep the snow off in Hoboken, N.J., March 7, 2018. "If your lock is frozen, Fordin said, "put the sanitizer on the key, and then put the key into the lock." ABC News' Mariam Alam contributed to this report.